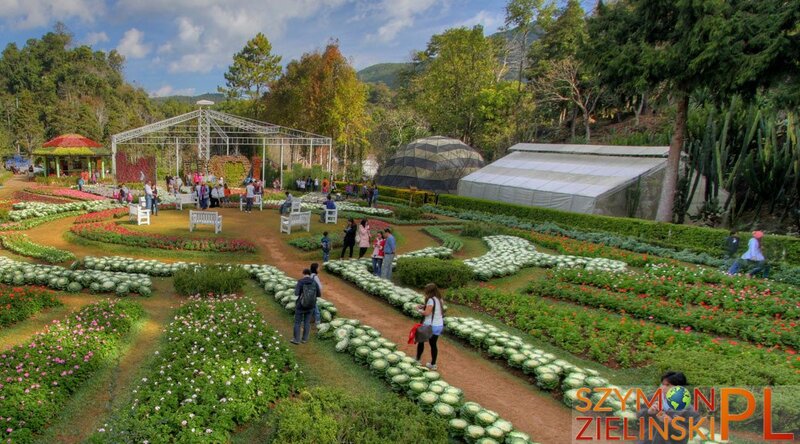 I recommend to spend the second day at Doi Ang Khang on visiting the Royal Project – actually Royal Agricultural Station. The Royal Project is really interesting! Since the temperatures are much lower than in the rest of the country (please remember that the temperature can drop below zero in December and January), at the Project you can find fruits that are non-existent in other parts of the country – like strawberries (the tastiest in all of Thailand! ), kiwi, pears or peaches. There is also a wide variety of vegetables, herbs, flowers, even tea and coffee. The entrance fee is 50 baht per person (about 1 euro). There are many interesting and beautiful gardens on the grounds of Royal Project – shaded moist garden, flower gardens – Garden 80 (named to celebrate 80. birthday or HM the King of Thailand), English roses garden, rhododendrons, scented garden, bonsai tree garden, natural rock garden… There is a lot of things to admire indeed. The variety of gardens guarantees great views at any time of the year. Let’s not forget to mention rare birds (including endangered and endemic species – together over 1,000 species) that attract both ornithologists and photographers alike. It is possible to rent a room inside the Project (but don’t forget to book ahead in the high season – usually months ahead! ), you can take a peek at the house for Royal Family (rather modest and seems unused for years), finally you can try out local specialities in a very nice and cheap restaurant. Plus there are some nature trails, hill tribe villages, mule riding (not common to see those animals around!). If you still have time after visiting the Project, I recommend to continue forward to Nor Lae village, located at the border with Myanmar (Burma) – I will cover it in the next post. One last thing to keep in mind (same as with the other Doi Ang Khang posts) – the photos in the gallery come from all three different trips to Doi Ang Khang. Some of them were taken with my previous camera (non-SLR). Entrance to Doi Ang Khang Royal Project, Chiang Mai province, Thailand. Wejście do Projektu Królewskiego Doi Ang Khang. Prowincja Chiang Mai, Tajlandia. Shaded moist garden at Doi Ang Khang Royal Project, Chiang Mai province, Thailand. Zacieniony ogród z wilgotną roślinnością. Projekt Królewski Doi Ang Khang, prowincja Chiang Mai, Tajlandia. Colourful flowers at Doi Ang Khang Royal Project, Chiang Mai province, Thailand. Kolorowe kwiaty na terenie Projektu Królewskiego Doi Ang Khang. Prowincja Chiang Mai, Tajlandia. Doi Ang Khang Royal Project, Chiang Mai province, Thailand. Projekt Królewski Doi Ang Khang, prowincja Chiang Mai, Tajlandia. Jumping photos are always nice! Doi Ang Khang Royal Project, Chiang Mai province, Thailand. Skaczące zdjęcia są zawsze mile widziane! Projekt Królewski Doi Ang Khang, prowincja Chiang Mai, Tajlandia. Indoor plantations. Doi Ang Khang Royal Project, Chiang Mai province, Thailand. Plantacje pod dachem. Projekt Królewski Doi Ang Khang, prowincja Chiang Mai, Tajlandia. Bonsai garden. Doi Ang Khang Royal Project, Chiang Mai province, Thailand. Ogród z drzewkami bonsai. Projekt Królewski Doi Ang Khang, prowincja Chiang Mai, Tajlandia. Natural rock garden. Doi Ang Khang Royal Project, Chiang Mai province, Thailand. Naturalny ogród skalny. Projekt Królewski Doi Ang Khang, prowincja Chiang Mai, Tajlandia. The view from the natural rock garden. Doi Ang Khang Royal Project, Chiang Mai province, Thailand. Widok z naturalnego ogrodu skalnego. Projekt Królewski Doi Ang Khang, prowincja Chiang Mai, Tajlandia. Garden 80 – beautiful and colourful. Doi Ang Khang Royal Project, Chiang Mai province, Thailand. Ogród 80 – piękny i kolorowy. Projekt Królewski Doi Ang Khang, prowincja Chiang Mai, Tajlandia. Blooming sakura (cherry blossoms). Doi Ang Khang Royal Project, Chiang Mai province, Thailand.Garden 80 – beautiful and colourful. Doi Ang Khang Royal Project, Chiang Mai province, Thailand. Kwitnąca sakura (wiśnia). Projekt Królewski Doi Ang Khang, prowincja Chiang Mai, Tajlandia. On the way to the Royal Garden. Doi Ang Khang Royal Project, Chiang Mai province, Thailand. Po drodze do Królewskiego Ogrodu. Projekt Królewski Doi Ang Khang, prowincja Chiang Mai, Tajlandia. Royal Garden – here usually members of the Thai Royal Family relax after work. Doi Ang Khang Royal Project, Chiang Mai province, Thailand. Królewski Ogród – to tutaj zwykle członkowie tajskiej rodziny królewskiej odpoczywają po pracy. Projekt Królewski Doi Ang Khang, prowincja Chiang Mai, Tajlandia. One of the nature trails. Doi Ang Khang Royal Project, Chiang Mai province, Thailand. Jeden ze szlaków krajobrazowych. Projekt Królewski Doi Ang Khang, prowincja Chiang Mai, Tajlandia. Fruit plantations. Doi Ang Khang Royal Project, Chiang Mai province, Thailand. Plantacje owoców. Projekt Królewski Doi Ang Khang, prowincja Chiang Mai, Tajlandia.